So, after a long time we finally have new iMacs. What’s surprising is the fact i can’t remember the last time I was so excited about hardware releases! All the models have discrete Radeon graphic cards, intel integrated is no more in iMacs ! 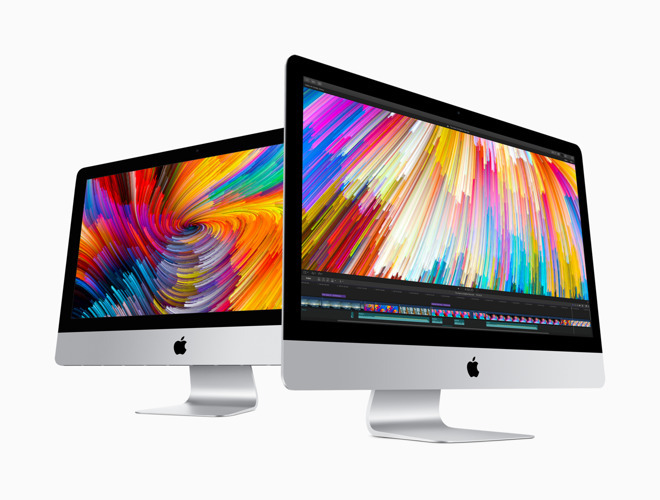 In 21″ iMacs both Ram and CPU are socketed which means they are user accessible and can be replaced !!!!! It is the first time since 2012 when iMacs got the new DVDless case. The only thing missing is the ram door, which still is present on the 27″ model, but at least we can upgrade the machine when warranty expires. iMacs now have both standard USB A type ant the new Thunderbolt 3 with USB C. This is huge. Why they didn’t do it on macbooks also, is beyond me. November is going to see the introduction of creazy powerfull and expensive iMac Pro based on Xeon cpus with 8 all the way up to 18 cores, new Radeons Pro VEGA series, which are not even available on the market yet. The pro is going to hav. e up to 128 GB of ECC ram like the Mac Pro or servers. All the new iMacs are based on DDR4 ram ! At last ! We also have new Macbooks and Macbooks Pro based on the Kaby Lake architecture and with a bit better prices and configs. The new iOS 11 is going to be a huge step forward with many enchancements, especially on the iPad. macOS 10.13 named High Sierra is going to the Leopard and Snow Leopard tradition. It means changes mainly under the hood. The big news here is the native support for external GPUs through Thunderbolt! With Apple’s blessing, true Plug & Play ! Smaller, a bit less significant news include tvOS, watchOS, new Swift 4 etc. So we have a lot to look forward to ! 2x Mac mini to choose from 2011 or 2014 year. The best Apple desktop even... ForkLift 3 now in Polish!